The PRG101 and PRG501 Series pressure regulators have an advanced design, consisting of a precision measurement capsule and a high gain servo amplifier to achieve high performance. The regulator can be used in a "dead end" application and will exhaust whenever the setpoint is lowered. Changes in supply pressure have a minimal effect on regulation accuracy. The regulator can be panel or pipe mounted. 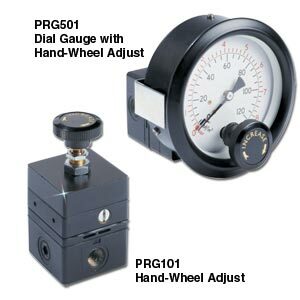 The PRG101 has two gauge ports available for mounting OMEGA pressure gauges for local indication. The PRG501 is ideal for having a dial gauge reading when the unit is panel mounted. The dial gauge is exterior to the panel.